Type 3 Chi Nu for GF9 Tanks! Hence the Type 3 Chi-Nu had a gun very similar in effectiveness with the T34/76, hence the fire-power dice will be the same between these two. That sorted, defence dice, I decided to give it a 1. It had an improved armour capability (front hull had now 50mm of armour, while the Type 97 Chi-Ha only had 25 mm). While one may think its’ armour was comparable with a T34, the side and rear armour is claimed to be similar (maybe slightly thicker than) the Type 97 Chi-Ha. The minimum armour on that tank was 12mm, while for the same T34 (excluding the bottom of the tank), the minimum was around 40mm. I think the comparable less armour on a Type 3 is also somewhat approximately evident from weight comparisons - T34 had total weight of 26.5 tonnes, while the Type 3 Chi-Nu only 19 tonnes. In any case, my thought is that Type 3 should be given a defence dice, but not as much hull points as the T34. So somewhere in between the Type 97 and T34, makes 4 hull points. As to the initiative, well, still considering keeping it low – these were kept for defensive roles. But if anyone here thinks it should ne higher, let me know, just can’t find justification for higher aggressiveness…. Anyway, there you have it. Hope it is of some interest, though I do need to admit, I am not sure if there even exists a model for this tank in the 1/100 scale. Still, it gives the Japanese player better tanks than the flimsy Type 89’s and Type 97’s to work with, so if someone happens to give it a go, let me know how it works. Also, points-wise it appears that it is costly, especially when compared to the recent card of the T34 (early) - which is basically the T34/76. This is where my gut feeling may be wrong, and it requires play-testing (this is what Christmas break is for, right?). On the other hand though, I do however feel that due to that "coordinated fire" rule, points may be justified somewhat - a Type 4 Chi-Nu supported by a cheap horde of Type 89's, may be the horror of any adversary. 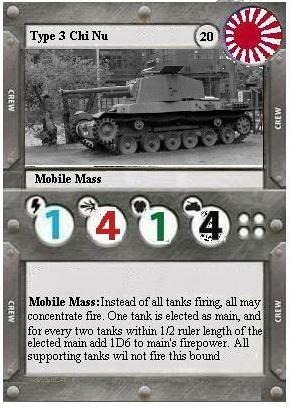 Plus, this tank does have 4 crew slots - so more upgrade capabilities as well. Anyway, always happy to hear any comments. Will post a copy of this entry to BGG forum shortly as well. Apart from that, have a great week ahead of you all and best wishes. Re: Type 3 Chi Nu for GF9 Tanks! Perfect timing, just got a type 97 I was going to green stuff into a Chi-Nu. This feels pretty good I think, from what I heard/read before this one was basically the Japanese equivalent to the M4 Sherman (but lesser armor and the gun was a bigger pain to load) so in my head I was thinking 20 points for it already with just about the same stats. I also like the low initiative for the Japanese forces, I think that it fits their style well along with supposed low visibility inside as well. Cheers for another awesome card, hope the coming week goes great. Cheers, and just noticed that you said about the stats for a Chi-Nu on my older Type 97 Chi-Ha post... and I totally forgot about it! Blah, I reinvented the wheel, gee I am smart ain't I? But at least I dug myself into some more data and a bit of history as well.